Instructor Robinson has been training consistently in various martial arts since 1999. His field of expertise is in the 2000 year old Korean style of martial arts called Tang Soo Do, but his experience also includes Judo and Ju-jitsu. Instructor Robinson has been a student of the martial arts since the tender age of 11. In 2003 he tested for the rank of Black Belt in front of the late Grandmaster Jae Chul Shin. This was not the final stop for Instructor Robinson, in 2010 he successfully passed his test for 3rd Degree Black Belt making him one of the youngest 3rd Degree Black Belts in his region. His unique skill set and commitment to the art has opened the door for many teaching opportunities. 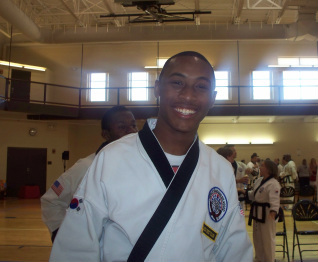 As a certified Instructor in the World Tang Soo Do Association, Instructor Robinson has taught martial arts to many students both young and old. Starting at 16 years old he was the lead Instructor at Double Dragon Tang Soo Do under the guidance of Head Instructor Jeffery Wheeler. At Double Dragon, Instructor Robinson sharpened his teaching skills by instructing classes 6 days a week from 2004-2010. Not only did he teach children but he also trained adults who were much older than him. His passion for teaching children is infectious and his ability to blend self defense, character building, and fun is unparalleled. Outside of Double Dragon, Instructor Robinson has lead multiple after school martial arts programs in partnership with the Flint Community Schools. Shakera began her training in 2005 at Double Dragon Tang Soo Do in Flint Michigan. Her natural leadership skills and attention to detail caused her to excel as a student and eventually a teacher. 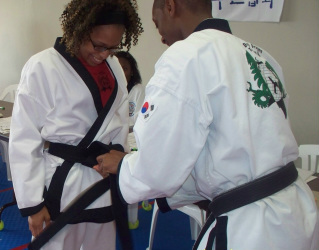 In 2009, Shakera successfully passed her test for 1st Degree Black Belt. It didn't take long for Shakera to become a leader and teacher. Even before obtaining the rank of Black Belt she was teaching multiple classes a week. In addition to her teaching responsibilities inside the karate school, Shakera lead multiple after school karate programs for the Flint Community Schools. As an instructor, Shakera is very passionate about child development and takes her role as a teacher seriously. Outside of martial arts, Shakera has a bachelor's degree from Eastern Michigan University with concentrations in Elementary Classroom Fundamentals,Social and Cultural Issues, and Emotional Concepts for Special Education Students. Shakera's background gives her a unique perspective as a martial arts teacher, and we are lucky to have her. She has truly committed her life to serving the youth of our community.